Dr. O'Shea completed her undergraduate education at Yale University and received her M.D. from Vanderbilt University School of Medicine. While at medical school, she was inducted into the Alpha Omega Alpha Honor Medical Society. She completed her training at the University of California San Francisco Medical Center, receiving the Society of Laparoendoscopic Surgeons Award. 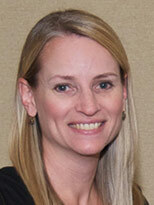 She is board-certified in ob/gyn and is a member of the American College of Obstetrics and Gynecology. Dr. O'Shea joined Ob/Gyn Associates in 2001. While in Akron, she has been honored with the Akron General Department of Ob/Gyn's Attending of the Year award, and the Council on Resident Education National Faculty Award. She is a two-time recipient of Summa Health System's Elite Patient Care Award. Dr. O'Shea is a member of the teaching faculty at both Akron City Hospital and Akron General Medical Center. She also staffs the Adolescent Clinic at Akron Children's Hospital. Dr. O'Shea teaches a formal laparoscopy / hysteroscopy course to resident physicians at Akron General Medical Center. Her areas of interest include adolescent gynecology, alternatives to hysterectomy, and minimally invasive surgery. Dr. O'Shea is married to Stewart Moritz, a professor of law at the University of Akron. They have two children. In her spare time, she enjoys running, reading, hiking, gardening, and spending time with family.